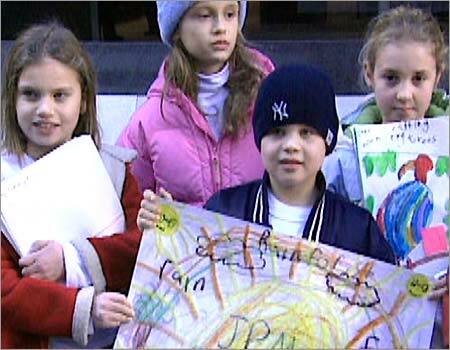 A group of Connecticut second graders was bused to New York last week for a well-publicized protest to save the rainforest. Questions arose when these 6 and 7-year-olds staged the demonstration as to who is behind the event and whether the children are being manipulated and exploited to serve someone else’s agenda. “I think these kids need to learn how to read, write and do ‘rithmetic and think. I think first and second grade is way too young to be brainwashed with any sort of political agenda,” said Steve Milloy of CSR Watch, a watchdog group for corporate social responsibility. So what’s next? … in third grade do the children learn how to break police barriers?